Are you ready for the "Brother Battle" on Thanksgiving? If the Ravens are going to be deemed one the best teams in the NFL, then they need to beat the 49ers on Thanksgiving. Baltimore has struggled this year against under performing squads like Arizona, Jacksonville, and Tennessee, but has somehow managed to defeat Pittsburgh twice. The Ravens defense continues to impress and has held opponents to roughly 25 points per game and 344 offensive yards, as well as bailed out quarterback Joe Flacco too. San Francisco’s offense has averaged roughly 26 points and 323 offensive yards per game, while quarterback Alex Smith has recorded 13 touchdowns and is on pace to match his career high from the ’09 season, (18 TDs). Running backs Frank Gore and Kendall Hunter have combined for seven rushing scores and 1,154 yards on the ground, so expect the 49ers offense to challenge a Ravens unit that will most likely be without linebacker Ray Lewis for the second straight week. 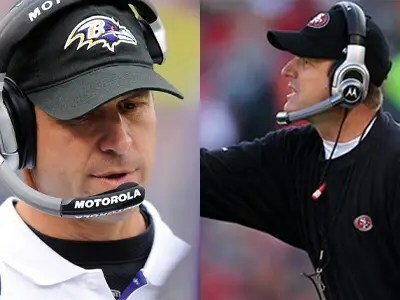 Finally, this matchup will also mark the first time in league history that two brothers, who’re head coaches, will face-off against one another. FUN FACT – If San Francisco wins this holiday clash, it’ll be the first time the 49ers reached 10 wins since the ’02 season.